Chapter Eleven of Legin finds our hero fronting the counter attack on the West Quarter. Buildings burn and blood flows freely. Legin paused and shook his head in awe at the great rifts and broken cliffs which now occupied the majority of the West Quarter. Strangely some of the buildings still stood like watch towers atop tall slivers of stone, but most had been destroyed by Aurora’s spell. With a deep breath and a slight wince in pain Legin continued down what remained of the hill to the campsite which had been set up overlooking the ravines. Only a few dozen or so people mulled about the small area as he wandered towards the small shelter. Before he even got close he could hear the arguing among the occupants and see the agitated gesturing towards the table. “Me?” Legin stammered awkwardly and moved closer to the table. “This is Legin, Arratoss,” said a snow elf calmly. “Aurora’s trophy boy,” Arratoss snorted in derision. 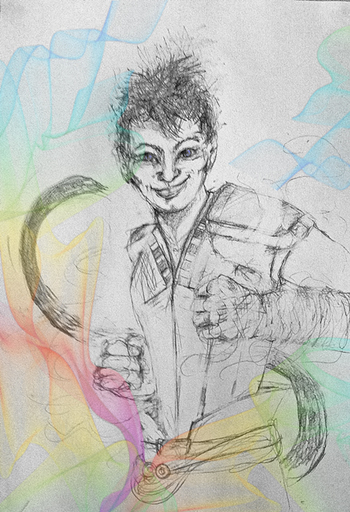 “Crazy monkey boy, you mean,” snickered a halfling, who was standing on a stool so he could see the table. The snow elf laughed aloud at that, drawing a scowl from the halfling. “Aurora asked me to help you guys,” Legin shrugged. “Help with what?” Arratoss was quick to ask. “I don’t see how you can do much with that injury of yours, Legin,” Ellinet remarked seriously. “Tactics things? Eloquently put, Legin,” Perry quipped. Perry nodded slightly and looked back down to the rough sketch of the West Quarter which accurately showed the recent canyons and sharp cliffs. “What are your thoughts then, Legin?” Arratoss asked seriously. Legin rubbed a hand across his hairless chin and looked closer at the map. “What are our forces like, Commander?” asked Legin as he looked back up to Arratoss. “Commander?” Arratoss balked and seemed awkward for the first time since Legin arrived. “What do you mean? We have a scout right here,” Legin replied and motioned to Ellinet. “Really, who’s court?” Legin asked curiously. “Is this really the time for such a question?” Ellinet asked in return. “We could all be dead soon, why not?” Perry shrugged. “So how’d you end up here?” Arratoss raised an eyebrow. Legin and the other two at the table nodded understandingly. “You mean a thief,” Ellinet laughed. “It was Tolveic Jayarr, wasn’t it?” Legin scratched his head. “Exactly, an excellent writer, but not a Halfling,” Perry said dryly. “And how do we do that?” Perry asked curiously. “Are you sure about this?” Arratoss gave Legin a quizzical look. “Well, seeing I am the closest thing to a scout and assassin, I’ll go and kill the leader of Saiross’s forces,” Legin replied seriously causing Perry to laugh aloud. 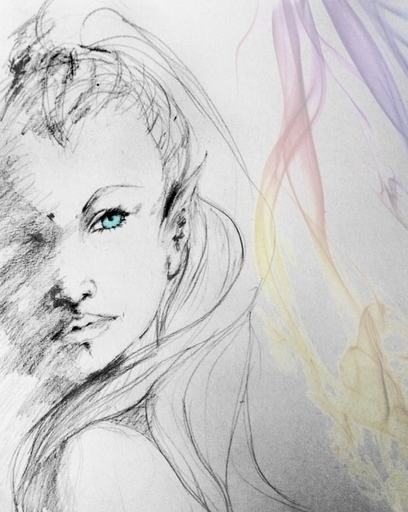 “Wait, you're serious,” the halfling balked when Legin fixed him with a stern glare. “If you truly are, Legin, then see if you cannot dispose of the archers on this craggy ridge,” Ellinet remarked and pointed to a spot on the map. “Good luck,” Perry called out to him as he left. “Be confident,” Legin mumbled to himself and he smiled as he headed towards the West Quarter. Legin continued down the hill away from the camp and very soon the ground fell away in a sheer drop down into a broken canyon. With a deep breath Legin stretched his back and arms, wincing only slightly as he felt a twinge in the stitches across his shoulder blade. The wound was not truly as bad as he initially thought, or made out to be, he had always liked to play for sympathy from others. With another deep breath Legin slapped his cheeks a couple of times and dropped from the ledge. Immediately he grabbed a hold of a rock, favoring his left arm, and began a swift decent to the bottom. Lightly landing on a large bolder Legin executed a front flip and landed on the ground. “Shouldn’t have done that,” Legin suddenly grumbled as he felt a twinge across his back. “Perhaps you should take it slower,” a voice from the side remarked. Legin jumped in surprise and readied himself for a fight, but he relaxed immediately as he realised it was Pip. “Well, you’re edgy, bro,” Pip laughed as he walked over. Legin waved away his friend’s concern and led the way along the canyon towards the center of the West Quarter. “Lead the way, bro,” Pip said with a smile. Legin nodded to his friend and returned the smile before picking his way through the broken rubble and buildings. The day drifted by slowly as the two of them walked carefully through the broken terrain, passing through half destroyed buildings and around huge spears of stone. They stopped often for a rest and to search for anything of value when the opportunity presented itself. By late afternoon Legin had led the way right to the western wall of the prison, which now stood many meters above them atop a cliff. The path southwards was harder in this area and many times they had to double back and pick a new direction. But as Inüer began to set and throw deep shadows across the prison Legin and Pip looked upon their destination. From the shadows of a narrow mouth of a jagged canyon they looked up at the small plateau where half a dozen archers had secured an outpost. From that position they had an excellent line of sight across a wide and mostly clear valley, and it seemed as if they dug in for a long stay. Many tents sat atop the hill as well, along with a few camp fires and even a zip line down to the ground for a quick exit. “Those tents look flammable,” Pip remarked and a wide smile came to Legin’s face. “Such an accident would indeed be a shame,” Pip chuckled. Legin’s eyes twinkled as he watched the archers atop the hill, and seizing his chance quickly darted from his position to another place of cover. Pip was right behind him and again they moved closer to the base of the cliff. The evening shadows aided their stealthy approach and very soon they were both at the base of the high cliff. Both of them chuckled at that and Legin moved to begin the climb. “Its fine,” Legin shrugged off his friends concern. “Know your limits, my friend,” Pip remarked and they both began to climb the cliff face. “How poetic,” Pip replied sarcastically. Both of them fell quiet as they drew closer to the cliff top, carefully choosing hand holds which would not disturb any rocks. Breathing slowly Legin peered over the lip of the plateau before he pulled himself up and motioned for Pip to follow. Together the slipped behind some supply crates and surveyed the narrow hill top. “These crates stink, what’s in them?” Pip whispered and crinkled his nose. Carefully Legin opened the closest one, but quickly dropped the lid shut and covered his mouth as the smell of salted fish enveloped his face. The lid dropped shut with a slight bang and both Legin and Pip dropped to the ground motioning for the other to be quiet. “What was that?” Legin heard one of the archers say. “Your imagination, like as not,” replied a second prisoner. “Nah it wasn’t, I heard it too,” said a third, this one female. “Then go check it out, Mr Paranoid,” the second man said with a sigh. “Don’t waste it, we haven’t got many,” the woman said. “Just give it here,” the first insisted. Legin and Pip looked at each other with concern. “What now?” Pip asked quietly. Pip smiled wide and nodded. Pip nodded again and readied himself as the footsteps of the archer grew louder. Just as the light of the burning torch flickered over the top of the boxes Legin vaulted over and into the prisoner. The man fell backwards and Legin slammed a fist into the man’s face. Rolling off the body Legin grabbed the torch and tossed it into the closest tent, which quickly began to burn. The other two prisoners were on their feet, stunned expression upon their faces as Legin sprinted towards them both. Sliding to the ground Legin swept the legs out from under the woman before jumping to his feet. Over the camp fire Legin skipped, picking up the frying pan which was cooking some fish in the process. In the same motion he kicked the burning logs towards another tent and smacked the remaining prisoner in the face with the pan. He was off at a run then, kicking some more burning logs and darting around the tents. The sounds of alarm erupted over the small hill as Legin grabbed a burning torch and set about putting the rest of the tents to the flames. Before most of the archer realised what was happening Legin was at the other end of the plateau. He tossed the torch onto the last tent before sprinting for the flying-fox to the ground. Without thinking he jumped atop the taught line of rope and using the frying pan he still held slid all the way down to the ground where Pip was waiting. Jumping to the ground Legin drew forth a dagger from behind his back and cleanly cut the zip line. Laughing aloud Legin and Pip slapped hands and looked back up to the burning hill top. The flames reached high into the early night’s sky and the yells could be heard echoing in the coming dark. “Doubt we killed any,” Pip remarked as he and Legin headed off. Legin laughed again and headed off at a jog back into the twisting canyons and up to what remained of the West Quarter buildings. His real mission was to kill the one who was leading Saiross’s men in this area, but that did not mean it had to be boring. Legin and Pip soon scaled another cliff which brought them up to ground level where the houses of the West Quarter still stood. Although many had fallen down due to the shaking of the earth the roads and alleys of the Quarter were still easy to traverse. “Do you know where the main base is?” Pip asked softly as they cautiously walked along a narrow alley. “No idea,” Legin replied and stopped walking to look up through the buildings at the night sky. “You too,” Pip smiled and headed off towards the west. Legin started off again, but he continued to look to the roof tops curiously. “Why are there no watchers on the roof tops?” Legin mumbled to himself before deciding to climb the closest house. A few minutes later Legin was squatting in the shadows of the roof, looking across the rest of the West Quarter. The night sky was clear and the twin moons drifted silently overhead casting a silver light on the prison. But still Legin could not spot any other prisoners on the roof tops. With a shrug he hopped to his feet and made his way from building to building, pausing in the shadows every now and then to survey the area. Lights to the south caught his attention and he headed towards them with renewed enthusiasm. As he drew closer to the lights Legin decided that a ground an approach would be better and carefully picked his path to the ground and an alleyway which he knew would lead him to the enemy base. As soon as Legin dropped to the ground a group of armed prisoners causally walked from the shadows of another road and towards him. Looks of surprise came to the faces of the armed prisoners when they spotted him and they all awkwardly drew their swords. Legin could not believe his bad luck as the men rushed to circle him, the tips of their poorly crafted swords pointing towards him. “Let’s just run him through,” shouted a second man who received nods of agreement. “Let’s not run him through,” Legin smiled, his eyes darting about for some escape. “You had better do what your boss wants then,” Legin was quick to add. One of the convicts closest to Legin grabbed his wrists and roughly tied his hands behind his back before he was urged along at sword point. Legin did not try to argue as he followed the leader of the prisoners along the narrow roads, after all he was there to get the leader of this group and they were taking him to him. Although it did concern him that their boss had insisted that he be caught alive. Soon the group moved from the alleyway and into a small plaza where many other prisoners mulled about the place or relaxed in one of the buildings. It was into one of these buildings which Legin was led and directed into a dimly lit room with a single window. Legin was shown to a chair in front of a desk where a solitary lantern burned. “I’ve been expecting you Legin,” said a gruff voice from the doorway behind Legin. Sucking in a quick breath Legin looked over his shoulder in surprise, he knew that voice. The door closed and the room grew brighter as Borris began to light the lanterns on the walls. “How?” Legin gaped as he watched the man slowly walk around the small room. The man turned his head to side and Legin gasped as he saw a deep gash across the right side of Borris’s face and cheek. The man’s ear was completely ripped off and his right eye was swollen and pale. “You deserved to have died,” Legin shrugged and looked away. “You killed Tressel,” Legin glared at Borris. The man calmed and moved away from Legin and behind his desk. “Like I did,” Legin remarked as he shifted his weight in the chair. “So you had me brought here alive to kill me yourself, is that it?” Legin scoffed and looked away distractedly. “Aurora’s ideals?” Legin asked curiously. “And that’s bad?” Legin looked curiously at Borris. “What’s your point?” Borris straightened up from leaning on his desk. Legin smiled and stretched his arms out wide as his tail uncoiled around his waist holding a dagger at its end, which he casually dropped into his waiting hand. Borris’s eyes widened and his hand darted for his sheathed sword. But Legin was quicker and his leg shot forward, kicking the desk hard and causing it to thunder into Borris. As fast as lightning Legin darted forwards and over the desk and drove his dagger deep into the man's throat. “I liked Tressel, and you killed her,” Legin simply stated. Blood poured from the dagger wound and down Borris’s chest as the man feeble grabbed at Legin’s arm. Twisting away from behind Borris, Legin ripped his dagger free before wiping it clean on Borris’s back as the man fell to the desk top. Nodding to himself in grim satisfaction Legin grabbed the lantern on the desk top and threw into the wall where it shattered. The lamp oil quickly caught alight and very soon the whole room was a blaze and then the whole building. But Legin was out the small window and jogging towards the North long before any of the prisoners knew of their leader’s death. Before the night was out Legin had made it back to the command tent on the Northern Hill and all the forces there advanced into the West Quarter. With no leader, Siaross’s men put up little fight and quickly made a disorganized retreat into the South Quarter. And as the morning dawned Legin and Pip sat atop a tall building and dreamily gazed to the south. “You used your tail to get your dagger and cut the ropes,” Pip laughed and shook his head.